On April 16, 1961, US Air Force Chief of Staff Thomas D. White (7th from right) hosted a conference at Randolph Air Force Base, Texas. 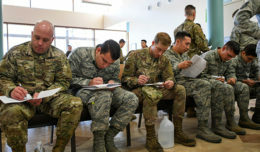 There the delegates proposed creating an organization that would help fortify the inter-institutional relations and planning of effective professional cooperation of the American Air Forces. 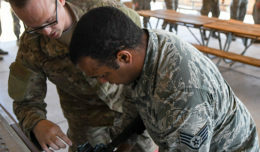 Members of 12th Air Force (Air Forces Southern) gathered to commemorate another year of success for the System of Cooperation Among the American Air Forces, with a 54th birthday celebration April 16th. 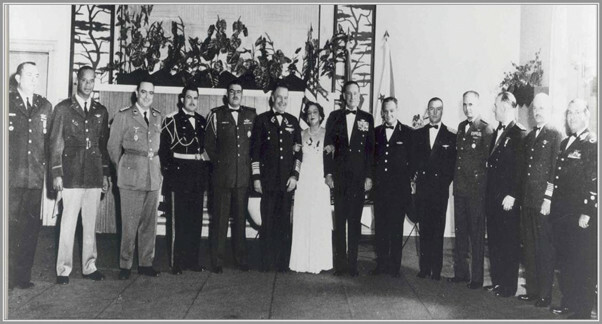 SICOFAA began as a meeting of officers from 13 different countries in 1961, led by Air Force Chief of Staff Gen. Thomas D. White, with the goal of strengthening the bond between the Air Forces in the Western Hemisphere. “SICOFAA’s primary mission is to promote and strengthen the ties of friendship and the mutual support of its participants through the sharing of common experiences, resources, the training and education of its personnel,” said Col. Alberto Moreno, SICOFAA Secretary General. 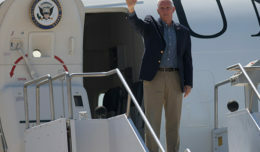 That first meeting evolved into an annual conference now known as the Conference of the Air Chiefs of the Americas, abbreviated in Spanish as CONJEFAMER, which has since grown to include 20 countries. There are also five observer nations and two special guest organizations. SICOFAA is permanent secretariat formed in 1965 and has since been hosted by the U.S. Air Force. The deputy secretary general position rotates amongst the other 20 Air Forces for two year tours in alphabetical order of the country they represent. Through the building of partner capacity members of SICOFAA are able to work in a combined atmosphere where political and diplomatic channels might be constrained. Even after more than 50 years, SICOFAA is continuously expanding its reach, and has recently added Mexico as its newest member. “Mexico became a member less than two years ago and will hosts this year’s Conference of American Chiefs, taking place this June in Mexico City,” said Capt. Kawika Berggren, SICOFAA executive officer. Recently, SICOFAA has taken on a new focus of humanitarian assistance and disaster response, partnership capacity building, and enhancing interoperability between partner nations. The culmination of this focus has been the establishment of doctrine on how SICOFAA member air forces would operate cohesively during an actual HA/DR event. The Chilean earthquake of 2010 forced the SICOFAA members to realize the need for closer coordination. Soon after, the organization held exercise COOPERACION I, focusing on HA/DR. In April 2013, SICOFAA held its second HA/DR exercise with COOPERACION II.